Like many who have worked on large software projects, I have been following the failure of the NSW State Government's unified transport card project with great interest. My family lived in Hong Kong for two years and we greatly enjoyed the "Octopus" stored value transport cards very much. Here's how it works: You go down to the station and pay an initial deposit of HK$150 (AU$22) and get an Octopus Card. When you enter the MTR (Mass Transit Rail) system you wave the card past a contact-less reader as you go in. When you exit the MTR system you again wave your card and the amount of the fair is calculated and deducted from your balance. The barrier shows you the remaining balance. As needed you top it up either at a machine or one of many shops near the stations. It's quick and easy. Now, a word about being contact-less. This is key, you can leave the card in your wallet or at the bottom of your bag and just wave it over the reader, no extraction of the card from a purse or unreliable reads due to corroded contacts or erased magnetic strips. The same card works on busses, trams and ferries. I think the bus system was simplified to just have a flat fare for the route regardless of distance. The system works well, is simple (once you know), and positively encourages use of public transport. Hong Kong is one of the densest populations in the world so it's not a fair comparison with Sydney, but there are lessons to be learned about the power of simplifying the system. The most amazing thing I heard about the Octopus system is that it was designed by an Australian company, from Western Australia, none other than ERG Group. I was surprised how badly this project had ended until I read in the SMH on January 31 that the State Government had "offered no co-operation in simplifying the fare structure of Sydney's public transport system". Apparently, ERG were trying to model the existing over complex system and this meant putting up to 73 fares on one ticket. In my opinion, the introduction of a unified stored value ticket system should be accompanied by a drastic simplification of the fare system. Surely the costs of collecting all the current fares would be offset by the savings of the new efficient system, even with fare reductions for the longest travellers? ERG has "lost $250 million building the system" so far. They have received no significant income from the government, (which is further threatening to sue them for $500 million), and worse it sounds like they haven't received the support needed for such a project. The NSW State Government needs to have a good hard look at how they participate in IT projects. It's typical of government clients to go to market looking for existing software that closely matches their weird way of operating, riddled with perverse history, rather than going to market searching for worlds best practice and then bringing their operation into line with that. Can Microsoft be written off? I'm very inexperienced at home building radio projects. Inductors, in particular, seem rather mysterious to me. Microprocessor projects seem much more predictable, signals are either on or off, but radio circuits may or may not be resonant, may or may not oscillate, and they certainly change whenever you try to measure anything. The book "Experimental methods in RF Design" by Wes Hayward and others (aka EMRFD) it truly an inspiration and after reading it for months, and a few false starts, I've just completed the very first project in the book, a 40m (7MHz) direct conversion receiver with just two active components. The design uses an NE612 oscillator/mixer to do most of the job and an LM386 as an audio amplifier suitable for driving headphones. NE612s don't have a lot of dynamic range so the only gain control is a pot at the antenna that serves as RF attenuator and overall "loudness" control. This works really nicely. I can't reproduce the circuit here, but it's Figure 1.9 in EMRFD and uses only a handful of components. The design is very similar to this one. My implementation is very ugly construction and I've mounted it in a rather over-engineered box with a transparent lid - I thought it might be a good bit of home brew art to show at the Wyong show. This project has taken some time to get started. First I soldered a trimmer and an off the shelf inductor the the board and attempted to confirm to myself that it was resonant at 7Mhz. I couldn't get a dip on my dip meter and couldn't see any sensible voltage peak when sweeping an RF oscillator. I was stumped for weeks. (Thanks to VK2ZAY for his encouragement during this frustrating stage). I wound my own inductor using a toroid but still had trouble coupling to it. In the end a single loop of wire (soldered into a loop) running through the toroid and then around the coil on my dip meter worked and resonance was found. A few extra capacitors later and it was in the right place. This is a major breakthrough for me! Next I built the circuit for the oscillator (active components inside the NE612). Holding a short wave radio near the circuit and sweeping the tuning cap quickly showed that it was indeed oscillating nicely. Finally, an LM386 was ratted from another project and the audio stage built. It all worked on the bench, and would receive my GDO, so I installed it in a box and powered it from external batteries. Turns out the NE612 is a little voltage sensitive and my re-chargeable 4 AA battery pack had dropped in voltage. Fresh batteries and it now works. The sound is very pleasant and there's no doubt that it's very satisfying to listen to a radio you've constructed yourself. Here's a recording of ZL2JR from New Zealand and some tuning around here. Attended the Coffs Harbour radio expo on Sunday. 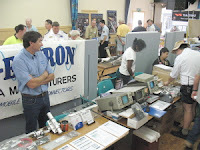 While a lot smaller than the Wyong field day I'm looking forward to in a few weeks, it was a fine event with lots to look at including some excellent home brew electronics and a diverse trash and treasure sale. I've been looking for an RF signal generator and was very pleased to pick up a nicely built Electronics Australia design which includes a frequency counter for $25. There were lots of books on sale and I purchased a slightly damaged copy of the RSGB Radio Communications Handbook at a good price. A great read. The home brew display, which regrettably didn't have anyone with it to talk to when I was there, had a fascinating 80m double side band transceiver and a little portable whip with antenna tuner built in - rather like those suspicious "miricle antennas" you see advertised. Lee Andrews was there selling rigs and seemed to be having a good time, it's a pity he doesn't get to Dural from time to time if only to keep his mood positive. A great day, I'll be back next year with any luck. Photos. Might be a little slow to respond this week as I'm on holiday at Coffs Harbour. Catching up with some friends and family and most importantly the radio expo on Sunday. It's raining quite a bit here but the fun news is that the carnival is in town. A great old fashioned show with all the authentic gear. They certainly weren't making money when we visited last night - more staff than customers. I'm sitting in the local internet cafe with about 10 others with internet addiction. Tried using their supplied windows computers but they are so bogged down with anti-virus measures that I gave up and today I'm pecking away on the eeePC keyboard (but with an external mouse). 04:22 (local time) Engadget seems down. 04:23 Techcrunch is doing a fine job, a wireless backup device. 04:24 Macrumourslive has a feed that updates part of their page regularly. iPhone SDK coming February. 04:25 Only my friend Andrew is logged in to iChat down here, I think he was here last year too. 04:26 New iPhone software today. I'm running iTunes with my iPod Touch to see if there's anything there yet.. no. 04:27 TechCrunch just put up a picture, gosh Steve is wearing a black turtle-neck skivvy and jeans - what a surprise! 04:24 Some clouns at Cunning.tv claimed to be sending out video of this, but they're unreachable. 04:33 More iPhone software stuff, which has previously leaked. MacRumoursLive doing a great job. 04:36 What! I have to pay to get a software update for my iTouch? 04:39 iTunes Movie rentals! Great, but when will it come to Australia? 04:42 Movies will be available 30 days after DVD release, hmm, that's not really moving technology forward, I thought this might replace DVDs. Just checked with software update, nope. 04:46 Apple TV Take 2 No computer required. Just checked apple.com, there's still just something in the air. Gosh those AppleTV slides have a lot of words on them, I think Steve is loosing the plot in terms of minimalist presentation style. Perhaps he's got Bill Gates working for him now? 04:51 Engadget just reloaded, they have good commentary but I haven't been able to read it until now. They have a broken image in their page. 04:52 MacRumoursLive have ads in their feed. I guess that's fair enough. 04:55 He said there were four things to show: Leopard uptake success, iPhone success, iTunes movie rental, I count one important thing so far. 04:58 The Unofficial Apple Weblog is trying to load in my browser but going extremely slowly. Their coverage looks good but if you can't read it.. MacRumoursLive wins the liveblog hands down from here. 05:00 Apple TV update is free, well that's nice. Out in 2 weeks, so it's still got bugs. 05:04 "Fox wanted to make great movies, and get them into as many people's hands as possible" yeah but not until 30 days after physical distribution. They still don't get it, I'm surprised Steve went along with that backward step. 05:10 Worlds thinnest notebook! Now that's what we had a sleepless night for. 05:15 MacBook Air sounds awesome. I'm preparing my script for ABC Radio National breakfast. 05:20 First photos of the Air are up. Looks pretty ugly to me, are the keys really black?. Oh no, another video plug - Micro DVI. Converting units so it's 4mm to 19mm thin. You can "borrow" the optical drive from an existing machine (including a Windows box), very nice. 5 hours battery life - excellent! 05:26 US$1799 converts to AU$2002 (well, we'll see about that) Pre-order today, ships in two weeks. 05:28 I go to the Australia Apple store but it's down right now. 06:04 I'm done. See you next year. PS: I seem to be updating my iPod touch, not sure at what point it's going to ask for money..
Well done to MacRumoursLive for the best live blog of the 2008 MacWorld keynote. Low cost laptops. Has the OLPC project created a new category? CES. Is it just a bunch of thin displays? Wikia, Jimmy Wales’ Google killer? Scoble’s fuss about Facebook and more. This week we chat about Facebook locking out Robert Scoble for trying to extract his contacts, using OpenWRT in client mode, is OS X killing Linux as UNIX desktop environments, signs that BluRay might win the format war, Google’s distributed computing, and Pete reviews two books. I mentioned in a previous post that I've been interested in learning about the Atmel AVR microcontrollers. To get started I purchased an already constructed Arduino board and had a good experience using it's USB/Serial programming from my Mac. I don't feel satisfied until a controller board has been built from components, here's what I did. Built a minimal circuit based on the Arduino but without the USB stuff. On a Fedora 8 machine, did "yum install avr-gcc avr-libc avrdude"
I followed the excellent instructions by The Real Elliot here to get a sample program going and make a Makefile. 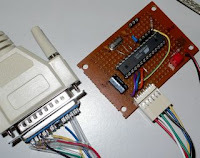 One thing that caught me for a while is that while plugged in to the programmer, the chip doesn't run. I'm sure I can fix that by adjusting the reset line or something. I've also changed the fuses on a chip so that I now get "avrdude: AVR device not responding", still trying to figure out how to get out of that issue.. All good fun. Here's some video from the ARNSW Home Brew meeting last night at the children's party room at McDonalds at North Paramatta. Hopefully, this will convey the flavour of these meetings - a lovely bunch of blokes.